With foul weather forecast for the weekend I took advantage of the mildest day of the week for a final attempt at catching a barbel this November. Despite the river being warmer than last week it was carrying less colour, but the afternoon was pleasant as was the evening until the rain set in and the wind picked up. I'd picked up some maggots on the way to the river to see if I could catch myself a chub or two by design, and to try out the MkII quiver tip section for one of my Interceptors. The rod worked a treat and the glass tip was soon registering a bite. When the second bite came I was ready and hooked something small and wriggly. 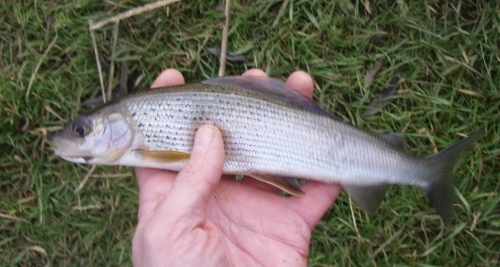 One of the targets I had set for myself this season was to catch my first grayling. I hadn't expected to do it on the maggot feeder, but that was what was wriggling on the end of the line. Far from a specimen I suppose it's still another personal best! Very pretty fish. Even so I was tempted to stick it back out on a set of trebles... If we get another cold spell I might dig out a float rod and have a serious try for some more - although I'll probably catch chub! After dark the rain arrived, but only stayed for an hour or so. Conditions seemed pretty good, but by ten o'clock not a bite had I had. With more, and worse weather on its way I packed up. Sure enough I drove home through a wave of torrential rain. Sure was glad I missed sitting out in it. Not a good month for some reason. I have lost touch with where the barbel are. Time to give last winter's haunts a bash to see if I can get another barbel before the year is out.